In October and November 2015, after having found a ridiculously cheap ticket (see the section on “getting there” below), I spent 8 weeks travelling the Philippines and Australia. I had 2,5 weeks in the Philippines and was super excited! Next to exploring the Taal Volcano in Tagaytay near Manila, one of the things on my bucketlist were the beaches in Boracay! 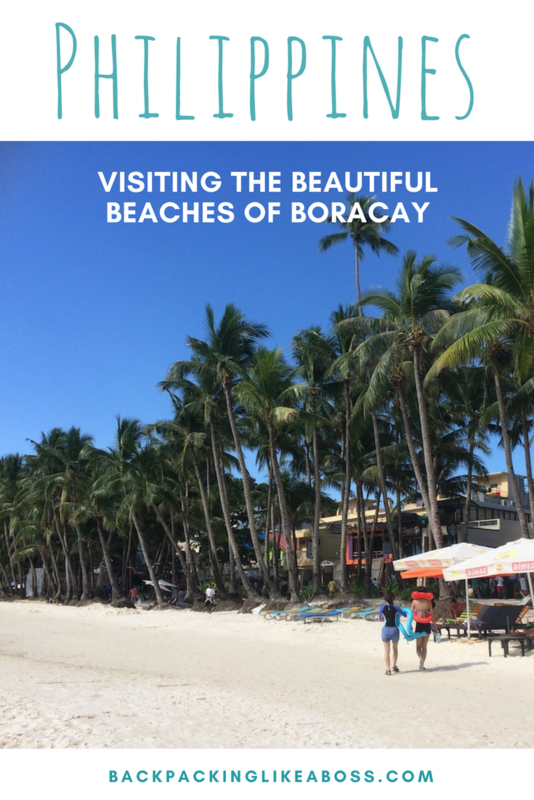 1 Boracay – a piece of heaven? 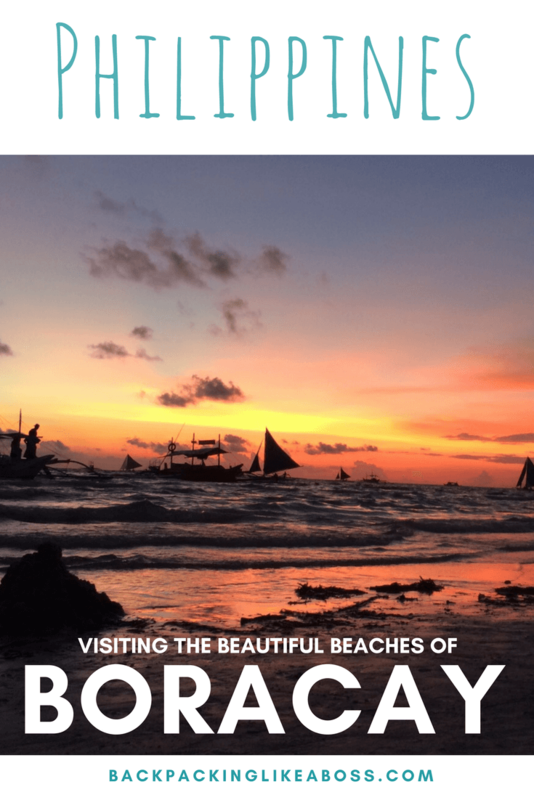 Boracay – a piece of heaven? 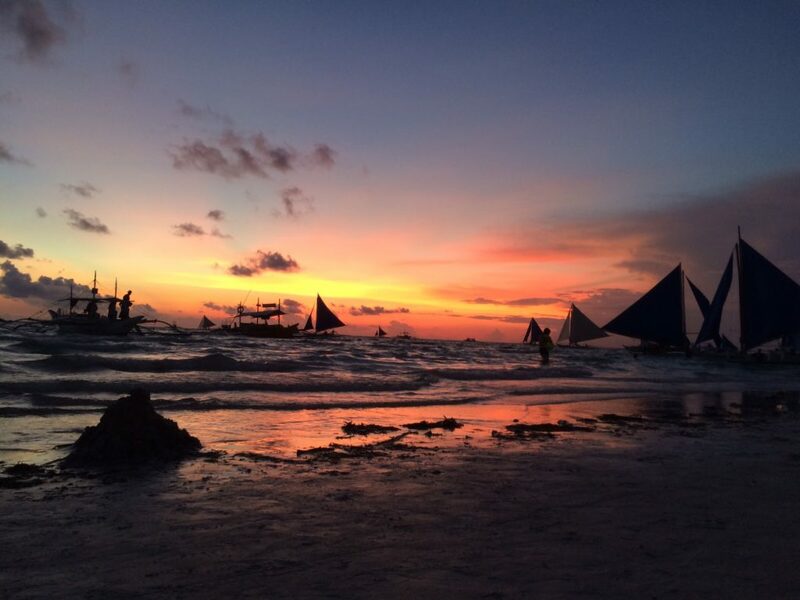 For many travelers, paradise is synonymous to Boracay. Boracay, a 10 square-kilometer island in the Philippines, has graced many “best islands in the world” lists by esteemed travel authorities. It’s no surprise why: few other beaches can compare to the powdery white sand and coconut tree-fringed coastlines. And, to top that: some of the clearest turquoise waters you’ve ever seen. Boracay is postcard perfect, to say the least. But on the other hand, Boracay attracts over 2 million tourists annually, and a handful of them end up never leaving 🙂 This is A LOT of tourists for a small island, and they all cluster around White Beach. Luckily, a part of these tourists are only day-trippers, but this small island can feel really crowded when arriving. What I saw on Boracay seems to prevail in many other Philippine destinations as well. And it’s not only foreign tourists visiting. Also local tourism has surged now flights are so super cheap (see the “getting there” section for info on flights). The most beautiful places that are also easy accessible (such as a daytrip to the Kawasan falls near Cebu) quickly fill up with locals, philippine tourists and foreign tourists alike. However, if you do a bit of research and take a few steps more than the average tourists, you still may find some hidden gems. Still, despite the tourists, the great thing about Boracay is that it offers something for everyone. Solo travelers, honeymooners, watersports enthusiasts, and families – all catered for. There are hundreds of excellent accommodations and dining options to cater to all budgets: from backpackers to the best in tropical luxury, Boracay has it. On top of that, the beaches in Boracay are amazing. And the good news: not all completely filled with tourists. Find my 3 favourite beaches below! White Beach is the most famous stretch of beach on Boracay island. But for travelers who are looking for a slice of paradise away from the crowds, I can really recommed Puka beach! Of all the beaches in Boracay that I visited, I loved Puka beach the most. 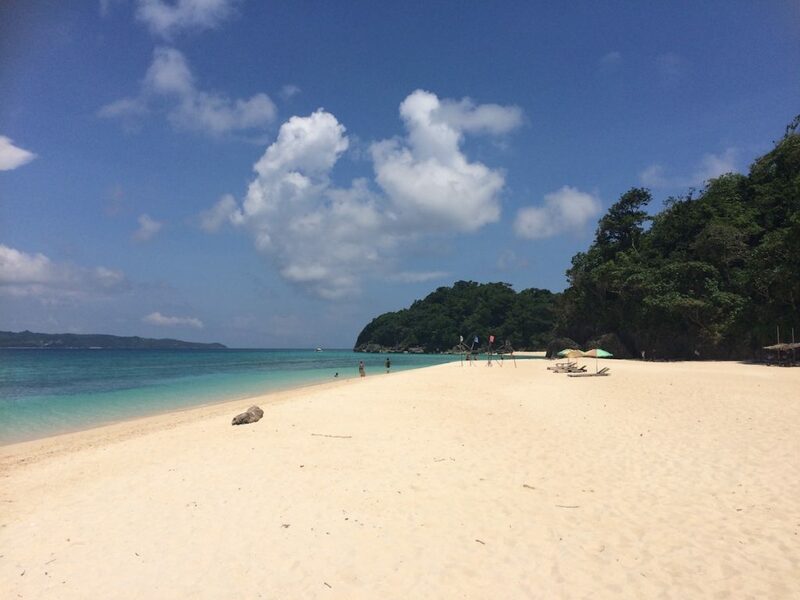 Puka beach is an 800-meter long stretch of white sand with lots of space to relax in. Local vendors offer chair rentals and umbrellas. You may really need this, as there is only a treeline to offer shade from the hot tropical sun. Since Puka beach is devoid of mass tourist establishments (there are no hotels, showers, or toilets), you can come to enjoy solitude and the view of azure waters. It’s the perfect spot for a picnic – bring your own food and refreshments, as well as a sarong, and you’re set for the day. Getting to Puka beach is easy with a tricycle (the Philippines’ take on a tuktuk): hail a private tricycle from the main road and you’ll be whisked off to Puka beach just 20 minutes away. It’s super cheap and I went back here twice! My favourite beach in Boracay – Puka Beach! White Beach is the most photographed beach of all the beaches in Boracay. It’s the best location for front-row seats to incredible sunsets. As soon as the sun starts setting, grab a cocktail to watch the sky change hues while the triangular silhouettes of boats make for a dramatic shot. The most amazing sunsets at White Beach! White Beach is dotted with beachfront hotels, bars, restaurants and clubs. It’s divided into three stations. Station 1 is where high-end hotels are concentrated, while Stations 2 and 3 are abuzz with bars, restaurants, and happy hours that last all day. Walk a little past station 3 to find a charming beach area called Angol, which still has the rustic bohemian vibe of Boracay’s early days. 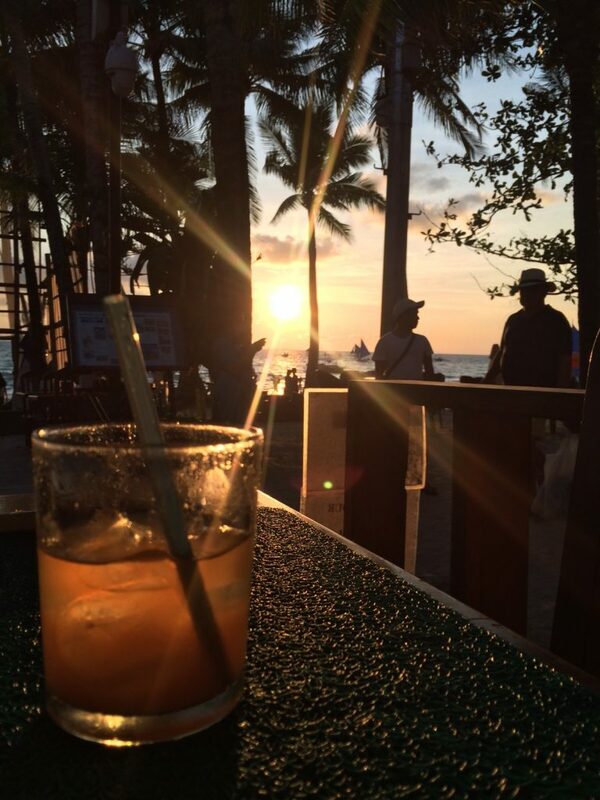 If you want to get ready to party the night away, there is no better way than to kick off a great evening with a sunset happy hour cocktail! I enjoyed a few of those 😉 Even if you are by yourself, it’s very easy to just head to the beach and make friends at one of the bars. 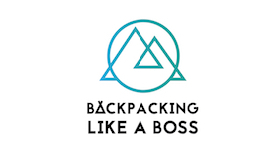 Or, join a group from the hostel you are staying at. If you are done with just laying around and feel like you could use some entertainment, head over to Bulabog! Still a nice beach, but much more windy that on the other side of the island. Therefore, Bulabog beach, located on the east of Boracay island, is a haven for kitesurfers. During the amihan season (which runs from November to May), Bulabog comes alive with kites of all colors. It’s a thrill to watch kitesurfers make the sport look so easy as they zoom by. The amihan winds are a welcome respite from the heat on White Beach, so grab a chair, sit back, and enjoy the tropical breeze. It’s super easy to arrange classes in kite surfing here too. The food and drink in Boracay are as much of an attraction as the island itself. 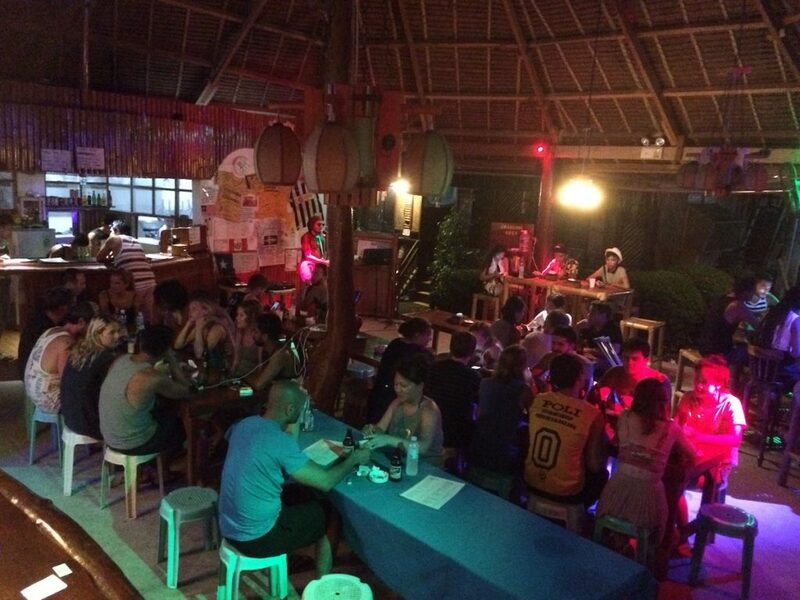 It’s well-known for the vibrant nightlife, where happy hours all day so if you love to party you’ll be in for a treat! Boracay has a dizzying array of restaurants, but to be honest – I was not super impressed. Yes there are foods for all budgets and appetites and you’ll be spoiled for choice. But, my idea of an idyllic island and paradise is not Macdonalds and Starbucks. But then again, if you your Starbucks fix – no problem. Just head over to the Starbucks branch on Station 2’s beachfront where you can sip a cup of joe while taking in the views. My favourite dining experience was to go to the local market. You could buy your own fish, meat and veggies and then take them to some of the restaurants around the market. For a small fee, they would prepare the fresh food for you. You can haggle a bit on the market, especially towards the end of the day. However, don’t haggle too much – we ended up with a bad lobster after some serious haggling. Being a tourist, you don’t see this from the outside. But when the restaurant cooked it up, there was no meat in it! With the people I met in the hostel, I went partying every night. First happy hour, then the beers in the hostel (which were very cheap), then some bar hopping to end up in a nice club! I danced until 4am a couple of nights and it was just amazing! There are so many options to stay on Boracay! 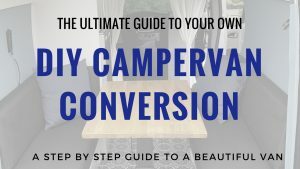 From very fancy to very cheap – it’s all there. Because I was travelling by myself, I decided to stay in a hostel. I stayed at the Frendz Resort, just a block from White Beach. I absolutely loved the place! They had free pasta & live music nights, there were always people around from all over the world and the place was clean too! I loved the little cabanas in which you could stay. There were both dorms and single/double rooms so everyone could have their pick. If I would go to Boracay again as a solo traveller, I would definitely stay here! 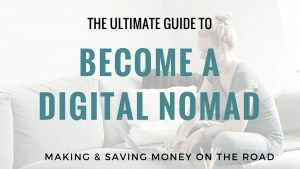 As I was already working as a digital nomad,I also needed a stable internet connection. At the time, I was mainly doing writing jobs and I was working on my startup. The internet connection at the hostel was fine enough for both of these jobs. Also, I went working in an air-conditioned coffee shop on the main boulevard one day and this worked out fine too! Getting to Boracay, just like other major tourist attractions, is quite easy. 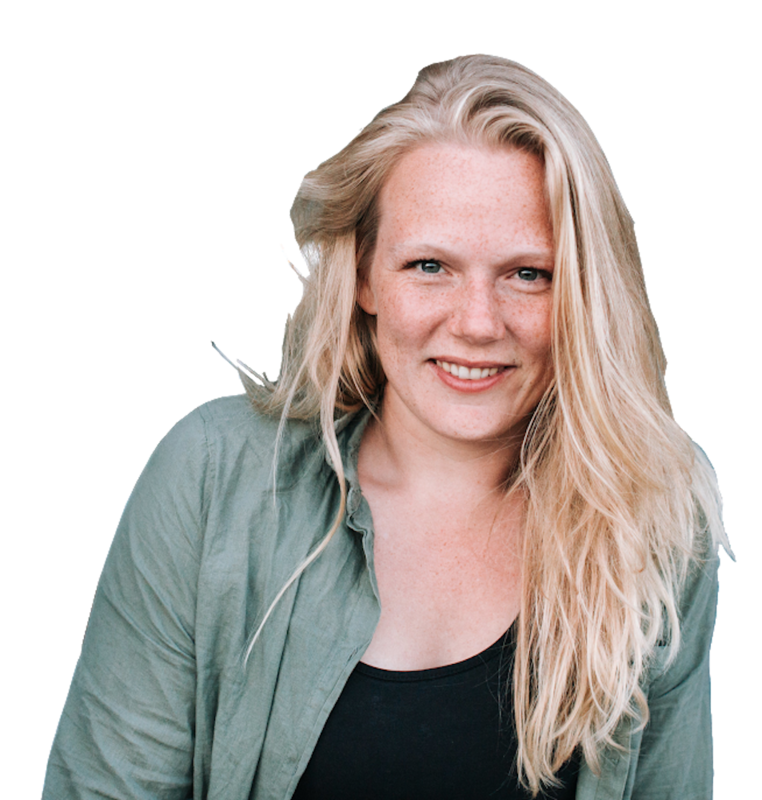 First I had to get to the Philippines 😉 I had managed to book a $300 return ticket from Dubai – Manila – Sydney and back with Cebu Pacific Air , and I flew for free to Dubai with my KLM Frequent Flyer Miles! Boracay is located in the Visayas region, and there are several direct flights available from Manila. There is the option of flying to either the Kalibo airport (cheaper flights, but you’ll have to take a 40-minute bus to Caticlan), or directly to Caticlan. Upon arrival to Caticlan, travelers are required to pay environmental and terminal fees before boarding a 20-minute outrigger boat to Boracay. There are many cheap flights to Boracay, but be prepared for delays. Budget airlines are notorious for not being on time, but once you get to the island it will be worth it. My plane got delayed for about 4 hours. So don’t book your international flights to close to your domestic flights – you may get into problems! Tricycles are the primary form of transportation once in the island, but if you’re staying at a luxury resort, many offer free shuttles to tourist spots within the island. 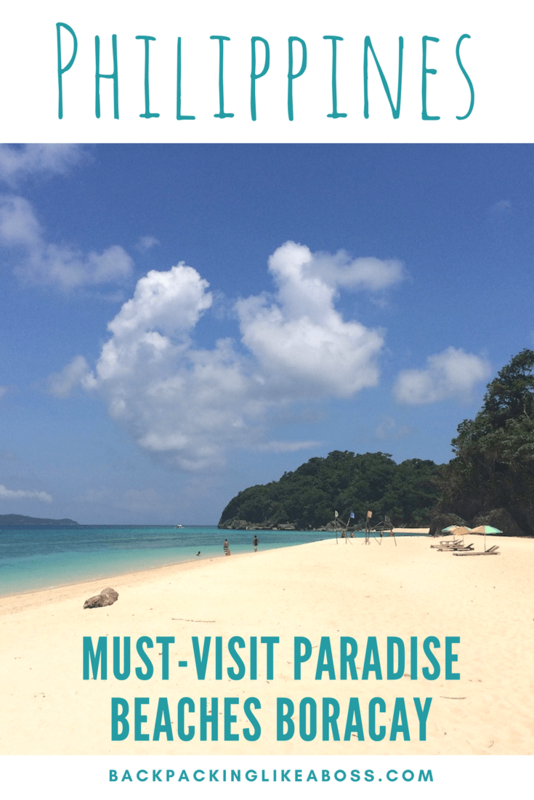 Any questions about the amazing beaches in Boracay, where to stay or how to get there? Feel free to comment in the posts below! Pin for later on Pinterest! Hi! I love the Philippines so much! I’m a last minute-traveler and flew from Italy to Manila during Christmas Holidays, pity I couldn’t get a ferry to Palawan which was my dream destination! I stayed mostly in Sablayan, Mindoro, and liked it a lot, especially the dives at Apo Reef. I would have skipped Boracay altogether because I thought it would have been impossible to unwind there… Happy you proved me wrong 🙂 Well, on my bucket list! Oh no, is Boracay really closed for visitors? Yeap, it was closed at the beginning of July with Koh Phi Phi in Thailand. So sad!! !